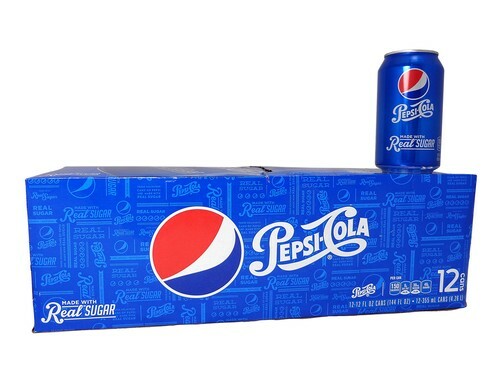 FRESH 12 pack 12oz cans Pepsi with SUGAR, not high fructose corn syrup (HFCS)!!! Great collector’s item too featuring the 1940s logo!!! For you youngsters out there, there is a very clear taste difference between sodas sweetened with Sugar vs HFCS. They also go down smoother too. ENJOY A STEP BACK IN TIME WITH A PEPSI WITH SUGAR MADE WITH AMERICAN PRIDE!! !